Geoboard was one of my favorite apps for the iPad, and I just found out it is also available as a Chrome App. (It is also in the Windows Store.) 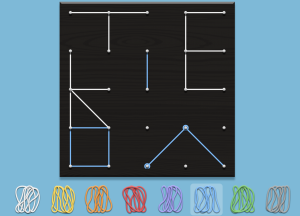 Geoboard is very slick, easy to use, and fun for students. Geoboard is a virtual geoboard, so no more rubber band accidents or clean-up. It is a great hands-on activity and is really good for inquiry-based learning and asking open-ended questions. The help section (the i symbol in the bottom right) is awesome, containing lessons and links to other useful apps. Using one rubber band, what 3D shape(s) can you make? Can you make a rhombus with an area of x? (With a given shape) Can you translate this x spaces? Can you rotate it x degrees? What would it look like flipped? What do you need to know to determine the area of the above rectangle?